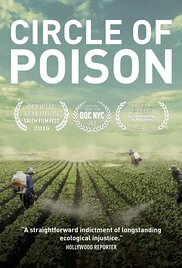 Circle of Poison tells the story of U.S. banned pesticides being sold to other countries through interviews with people in communities around the world. In each of them there are unusually high levels of disease and babies being born with defects. In India a family feels the terrible effects of the pesticide endosulfan when their son is born with macrocephaly. Later in Mexico a nurse tells the story of a pregnant mother working in pesticide treated farm fields. When her child is born he has cirrhosis of the liver. And the most troubling story came from Argentina where a town fought new pesticide testing on their community. The film also has interviews in the Untied States. One is with former President Jimmy Carter who before leaving office signed an executive order preventing the sale of banned U.S. pesticides to outside countries only to have the order cancelled by President Regan. The other interview is with Senator Patrick Leahy who recalls in the early 1990s trying to pass a bill banning global sales of pesticides. The bill passed the Senate but lobbyist influence led to defeat in the House of Representatives. Despite Circle of Poison bleak outlook , the documentary does offer hope. It reveals rural communities switching to organic farming without pesticide use. As well as growing protests around the world calling for an end to pesticides use and GMOs. This is a battle that I believe will be ongoing.